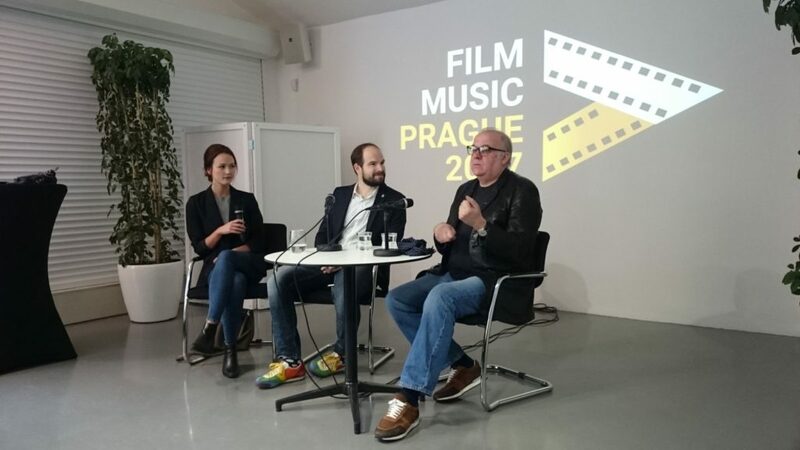 This year’s film music festival in Prague opened its doors with a concert of Craig Armstrong’s music, titled “A Story of Love”. 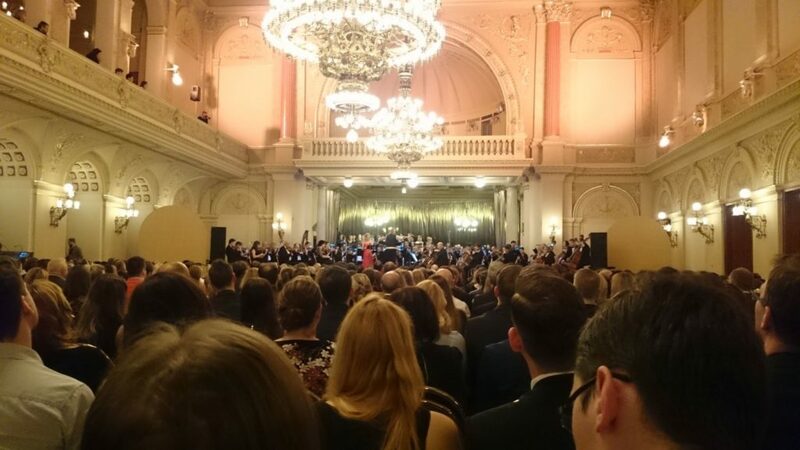 The concert took place in the very lovely Palác Žofín on an island in the Vltava river. 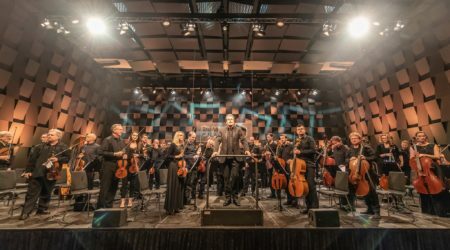 The lights in the venue remained switched on for the duration of the concert, which not only allowed the audience to keep marveling at the beautifully opulent interior of the venue but also enabled me to take readable notes for this review. Unfortunately, the announcement before the concert was only in Czech and therefore completely lost on me. 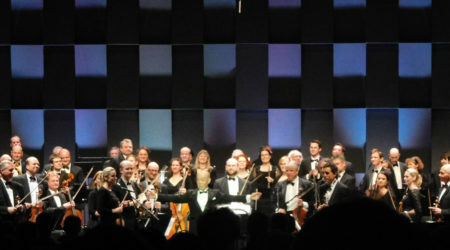 The concert itself had a grand opening with “O Verona” from Romeo+Juliet. The goosebumps this caused among the audience were directly followed by a couple of tears for the lovely rendition of the “Balcony Scene”. This emotional opening was followed by an equally touching selection of tracks from The Perfume. The soprano parts were sung by Christina Johnston and especially her rendition of “Meeting Laura” was breathtaking. Unfortunately, the Perfume section as a whole was a bit long, with all of the selected songs being on the slow side and therefore feeling even longer. I was also a little confused as to why there was such a large block of non-Armstrong music, in a concert that was advertised as a “Concert of Composer Craig Armstrong”. Especially since there is really no lack of beautiful Armstrong scores to choose from. The highly anticipated crowd pleaser came up in the programme next: Love Actually. I was a bit at a loss about how the music and the programme fit together since the first piece was already a combination of the announced “Glasgow Love Theme” and the “Portuguese Love Theme”. Afterwards, they played a longer version of the “Portuguese Love Theme”, which I initially mistook for a part of the following score. This really made me wonder why the World Trade Center score sounded so much like Love Actually. But when the hauntingly beautiful “Cello Theme” of the actual World Trade Center score was played, most of that confusion rapidly evaporated. The first half of the concert ended with the “March” from Cloud Atlas, which, with its multiple layers of differing melodies, was probably quite a challenge to conduct and execute as precisely as the orchestra delivered it. It might be my personal taste, but I thought the piano was a bit too loud and a bit too hard for this piece. The second part of the concert started with the “Opening” and the “Love Theme” of Far From The Madding Crowd, which was definitely what I was most looking forward to before the concert. The pieces were performed beautifully and made for a lovely second opening. The biggest surprise to me was the Elizabeth piece afterward. I was not familiar with this score previous to the concert and I was therefore positively blown away by it. The choir did a splendid job. Having sung the soprano in a choir for a time myself, I was even more impressed by the sheer loveliness of the high notes that this score demanded of the singers. The piece also brought a much-needed breath of drama into the, up to this point, very slow concert. The Snowden piece, another soundtrack that I had not been familiar with before, was surprisingly light-hearted and sweet. It kept the faster pace of the second part of the concert going nicely, as did the Moulin Rouge pieces afterward. Even though the vocals were just a tad too loud for my taste, I greatly enjoyed this soundtrack. And while the vocalists did in my opinion not quite reach the same emotional resonance as Ewan McGregor and Nicole Kidman, they did a good job. I must admit that I was rather put off by the lack of a duet in the Moulin Rouge part. What good is having two vocalists singing love songs if they do not do a duet? Thankfully this was corrected by the second encore being “Come What May”. Most interestingly though, the female vocals were not sung by the same Singer (Tereza Černochová) that sang all the other Moulin Rouge tracks, but rather by the soprano (Christina Johnston) who already took our breath away with the Perfume soundtrack. After the emotional rollercoaster that were the Moulin Rouge songs, the programme switched back to a bit slower, but nevertheless very lovely Great Gatsby soundtrack. This score was also revisited for the first encore, but between those pieces the orchestra treated us to “Prometheus Ascending” from the Victor Frankenstein score. I enjoyed this piece because it was a great contrast to all the other music played. The atmosphere of the piece gave quite a nice preview for the Alien concert that was to follow the next evening. In general, I was not completely pleased with the music selection of the first half, since, aside from the first piece, all the music was very slow and therefore there was not much variation in the displayed moods of the musical pieces. I was also a bit disappointed that the “PM’s Love Theme” was not played during the Love Actually part of the concert. It would have provided quite the perfect change in pace that I felt was missing. The second part of the concert was much of an improvement. For me, it saved the whole concert due to the musical variety it offered. 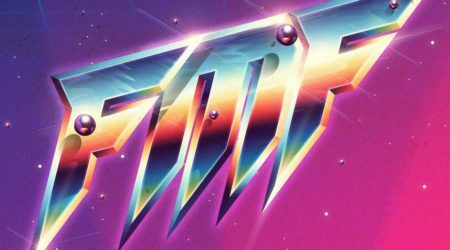 I was quite happy to discover so much new music, as well as rediscovering some less frequently performed tracks from well-loved soundtracks. After the concert, Craig Armstrong came to the stage and said a few words of thanks to both the audience and the orchestra.I could unfortunately not see him from my seat in the back of the hall, but that was rectified by the very interesting panel discussion that was held on the following day. The panel was a quite small affair (maybe 40 people) which both surprised and delighted me to no end. Mr. Armstrong disclosed interesting things about his way of composing, his early and later influences (a delightful mixture of classical, jazz, and popular music), his experiences with directors asking him to do an all-e-guitar-soundtrack, and his views on what determines and develops a composer’s style. Due to the rather small setting, there was ample opportunity for questions and afterward Mr. Armstrong took his time to sign autographs and talk to everyone.